One of the most desired account features is the ability to place different stars next to your name. These stars are given as the result of donations and purchases made to the site. There are different ways of getting a donor star to appear beside your name. The simplest and primary way to receive a star upgrade is to purchase forum gold using the The Purchase Forum Gold link. Another option is to mail the money to njaguar. For further information, read How to Purchase Gold with Postal Mail, Cash, or Moneygram. Yet another option is to offer Forum Gold to someone who will donate U.S. dollars to njaguar in your name in the Donate For Me Please thread. Make sure you read the Instructions first. Once you have completed any of the above methods, you can check the status of your stars by clicking the Settings link in the top menu. Then click the Change Star Settings button in the left menu. Note: this menu option will only appear once you have completed one of the above methods. Once you are viewing the Change Star Settings page, you can view a list of available stars and select the options you have gained access to. 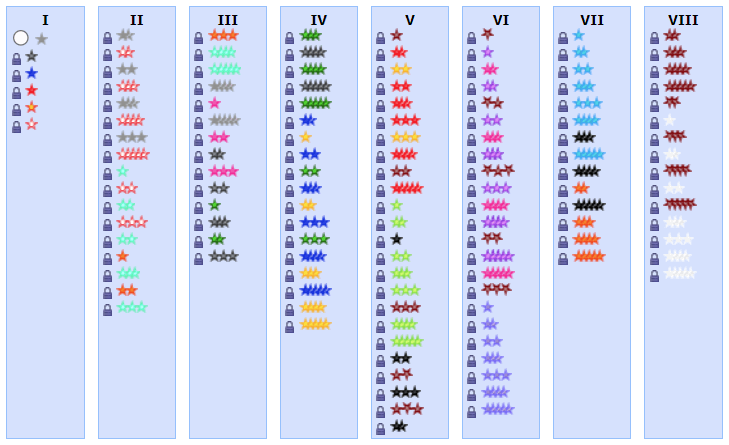 For each star there is a certain purchase threshold you must reach before it will be unlocked. Once a star is unlocked, you can switch your star settings at any time to use any of your unlocked stars.